As you know, a while ago I've got a used 500D for the purpose of studying how to reflash it (that is, brick it somehow and then attempt to recover it). I'm not exactly there yet with understanding Canon's startup process (some progress here and here), so meanwhile I've ironed out some ML bugs. Raw video (the old-style raw_rec) is also working (starting from today, May 14). Please discuss raw recording usage in the Raw Video section, not here. You should not expect ML for 500D to be as polished as on the larger cameras, but it's pretty good as a development platform, and fairly cheap if you want to do dangerous experiments on it. Don't just report issues. Go ahead and fix them! Hi a1ex, thank you for making ML available for the 500D. Using a recent nighlty, I can't use the video mode; as soon as I start recording it crashes and I have to restart the camera (err 70). I'm sorry but I won't be able to fix that as I don't have any programming skills (except html ). So yeah here are the logs. Also, it would be good to update the feature comparison matrix with "unofficial" modules; for example the 500D is the only camera to not support the bolt trigger one, and I wouldn't know it without asking the developer/scrolling through all the reply. Thank you for your time. Hopefully this will help. This is a strange bug triggered on 500D by simply drawing on the screen. Therefore, it can't be solved (at least not with my current knowledge). Last time I've checked it was working though (recording for at least 30 seconds). Try turning off Global Draw, then turn overlays back on one by one until you find the buggy one, then slowdown the corresponding drawing code by adding asm("nop") calls. Sure, if anyone finds a better solution, would be great. Full HD H.264 video recording works now with Global Draw enabled, using the new Nightly Builds. So you can use Focus Peaking, see the live histogram, etc. Great ! And raw recording is also working (both raw_rec and mlv_rec). With 864x486 maximum resolution, if you want continuous shooting, inside the 21 MB/s data transfer limit for SD bus (I mean "continuous" with 4GB max file size, of course, as 500D uses FAT32 formatted cards). For raw video disabling global draw is needed. If you try to enable it, recording will fail after a few seconds. ... which confirms this bug is very unpredictable; with the same build and same settings, I bet you'll get a crash sooner or later. Will the 500D shoot 23.976 fps at full 1080 with fps override? In h.264 compressed mode of course? Are the BMH (on camera help files) available for the Jan 03, 2015 nightly build? They were not in the /ml/doc directory of the zip file I downloaded! Also is there a reason for ISO 25600 being removed from ML v.2.3.500d.111? Analog ISO 500D is 1600, any higher value no make sense. This can be done in postprocess. Just picked up a used Canon T1I - 500D. 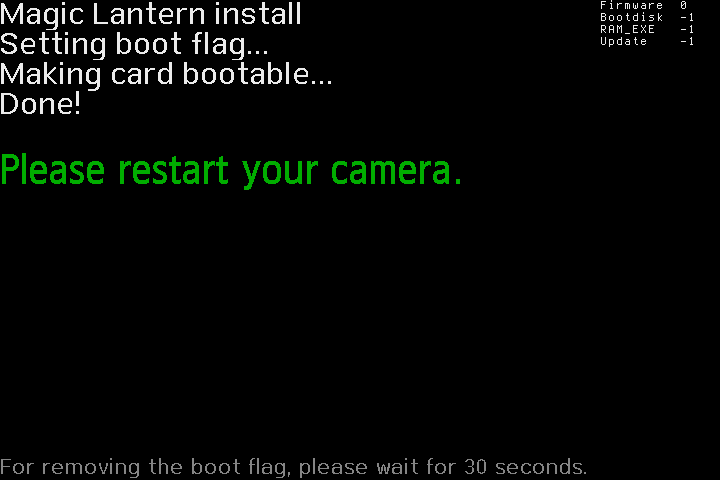 Verified my firmware was 1.1.1 and installed Magic Lantern on it. While going through the menus checking everything out, it showed the Internal Temp as "157 raw (help needed)". Does anyone know what this means and is it dangerous for my camera? Anyway, I am in the process right now of putting together the temp values to post in the other link when everything is done. Thanks once again for the quick response. Is it just me or is there no Bulb Ramping on the 500D/T1i? I had 1.1.1 installed before I installed ML. Everything seems fine, no errors, however I just have no option for Bulb Ramping. Searching Google and these forums hasn't led me nowhere. Intervalometer and Bulb Timer are there and working, but Ramping is nowhere to be found. I was really looking forward to trying it out. If it's not just me, is it in the works or never going to happen? Should I try a previous nightly and/or uninstall and reinstall Canon 1.1.1 and then ML (Edit: tried a few back to January with no luck)? Oh yea I just started with the 3/28 nightly. Any input would be appreciated. Thanks for everything else that's included though! Cheers. Does anyone thing that there will be a forthcoming fix for continuous recording on the 500d at any point? I wish I could do it myself, but I lack the necessary skills... sadly! Seamless recording beyond 29:59 in MLV/RAW was implemented in nightly builds about 6 months ago. Seamless recording in H.264 is not possible. Limit is coded in Canon firmware (at time of writing) and you will loose about half a second at 29:59. I read about Magic Lantern in a magazine about digital photography ("ct Digitale Fotografie" in Germany) and wanted to try out ML with my Canon EOS 500D. The article in the magazine said there were nightly builds and stable release for most cameras, but as far as I understand, this differentiation is not the case anymore. If I got the opening post in the thread right, installing "nightly builds" only is the way to go now. On https://builds.magiclantern.fm/#/ there is an option to show older builds. Since atm. I only want to use the additional function ML unlocks/provides, I'd be very interested in which of those previous versions/builds for the 500D could be considered the last "stable" version which a user should install. Can the 500D actually go above 1/4000 shutter speed with still photography? I was attempting to take wide aperture photos outside in the snow, but there's too much light. I've put it in live view and enabled exposure override, but above 1/4000 I see no difference in live view or in the photos. The resulting photo reports 1/4000 as the shutter speed when ML shutter is set for 1/8000. I got two contradictory comments on 1080p video. One suggested I can only do 1080p at 21fps. Another said that 1080p 30fps in working. Can we do 1080p at 24 or 25p ? At what max bitrate ? RAW: Maximum bitrate (card interface limit) is about 21 MByte/s and 1080p30 requires about 5 x 21 MByte/s for continuous recording. Is there some news about this crash? With my camera I can shoot video until I make ML menu appear (in order to change expo setting, eventually). Then the ERR 70 crash happen. I tried with all Expo override, GlobalDraw, movie tweaks and even energy saving disabled, the same thing happens everytime. Where can I find ALL older versions of ML in order to find the one I had before? That crash can be triggered by simply drawing on the screen while recording, even with a minimal autoexec that does nothing else. So... I have no idea how to fix it.